Now that the bathroom is done, I'm finishing up a few projects in my daughters room. A while back we moved my daughter from a crib into a "big girl" bed. Although I'm not doing a lot in there, there are a few small changes that I'm going to make to her space. You can see the nursery version of her room HERE. The first change is to the wall next to the window. I had a baby quote there in vinyl and I was done with it. I took that down and put her ikea hack bookshelves on that wall. However, since the shelves are low so that she can reach, I still had a big space to fill. Then I came across this printable from Lily & Thistle and fell in LOVE! Please be sure to follow the link above if you want a copy of your own. Adorable! So I printed it at an 8x10 and then set out to create a frame worthy of such a beautiful print. This is what I came up with. 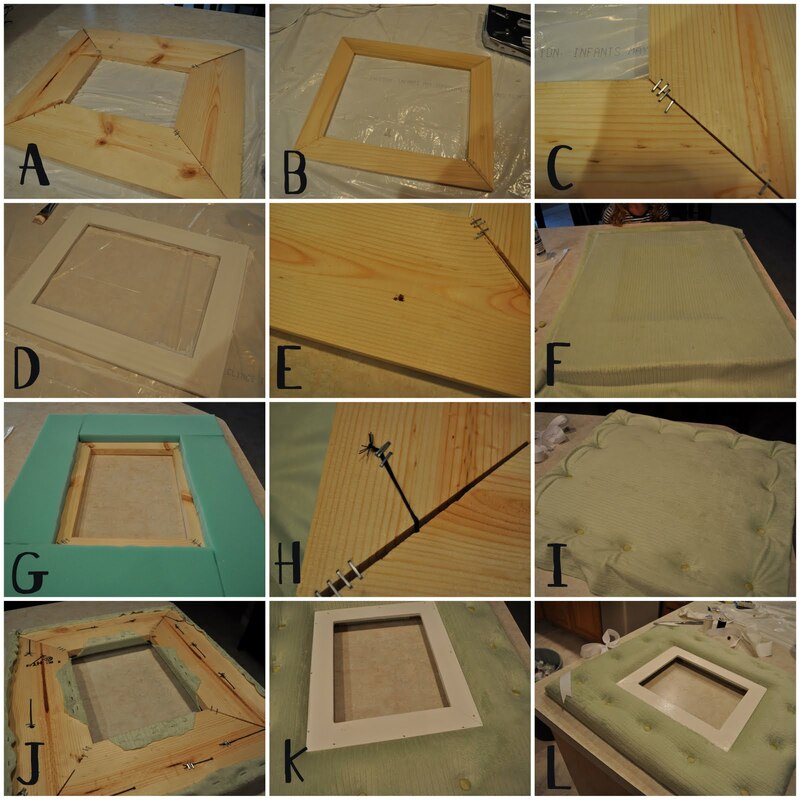 A tufted picture frame! Isn't it so fun?! My thought was that it would look like the cushion of a throne. Not sure is does, but I am loving the color and texture it adds! It was a little complicated to build (and I'm sure my crazy methods made it more so) but I'll attempt to explain my process to you. First up, you need some glass the size of whatever you are framing. I just bought a cheap-o 8x10 frame and stole the glass out of that. Then using that as your guide, cut a frame out of thin slats. The frame should overlap the glass. (this is the frame in image B) Then cut a second frame our of bigger boards. (image A) I used a 1x6. This frame should overlap the first frame. Lay your fabric over the top, and you are ready to start tufting! I covered buttons. My process went something like this. 1. Cover a button 2. Shove a needle and thread up through the frame, catch the button and go back through the frame. 3 Turn over and pull tight 4. Knot and staple the thread to the back of the frame to secure. Repeat. I did the four corners first and then worked my way around. When you are done tufting, it should look like image I. Now you can add the center frame. I pushed it down the into hole I left for it, and nailed it in place. Then just touched up the nail holes with paint. Add a bow to the top. I also added a ribbon loop to hang it with. Add your glass and art. (I used silicone to glue the glass in place and then just taped the print to it) and your done! I sure hope that made sense! Anyway, I love how it turned out and can't thank Hannah enough for the great print! Can't wait to show you what other things I have up me sleeve for in there!